Hoggus just released a Denden. Dendens (でんでん) are enemies from the Game Boy Advance game Wario Land 4. They are the creations of the pig-like painter Hoggus, who uses his sketchbook to bring them to life. They can be found exclusively in Doodle Woods. A similar species known as Butatabi is another creation of Hoggus. 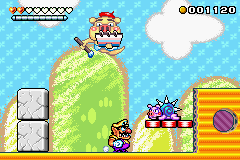 These enemies don't attack directly; instead they just move randomly, waiting for Wario to get close. When he does, he will take damage due to the spikes on its back. To defeat it, Wario simply must ram at its head. He will not receive any Coins though, as these enemies can respawn an infinite amount of times. This page was last edited on September 25, 2017, at 00:31.